I have a fetish for architecture; can you tell? While the bustling city of Saigon was out partying, working, scaring people, whatever it is that they do on Halloween last night (which probably doesn’t include trick-or-treating..or do they now? 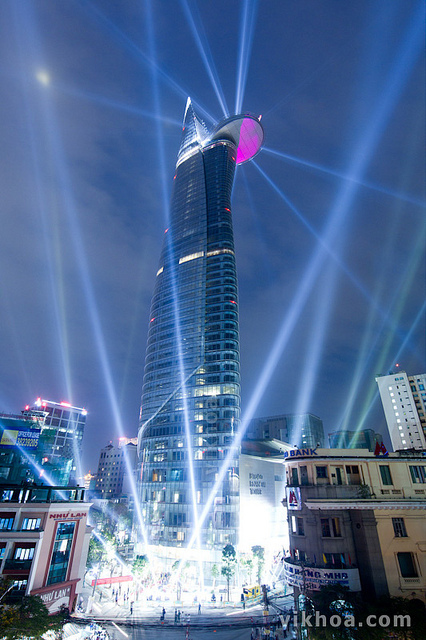 ), many also stopped by the Bitexco Financial Tower (BFT) despite the downpour to witness the official inauguration of Vietnam’s new highest tower standing at 262 meters high with 68 floors. 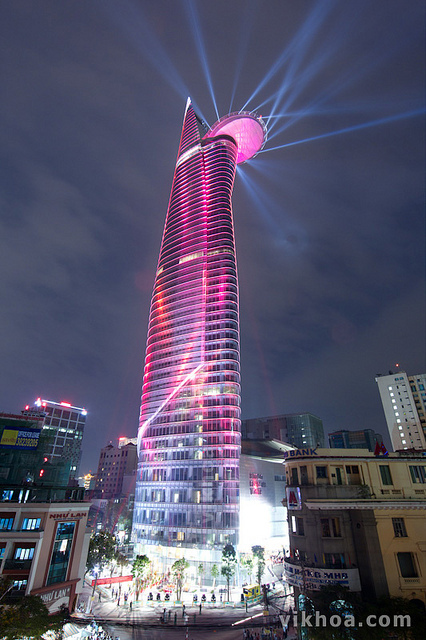 According to VNRE, this lotus-shaped tower is a symbol for the development of Vietnam in the era of international economic integration. 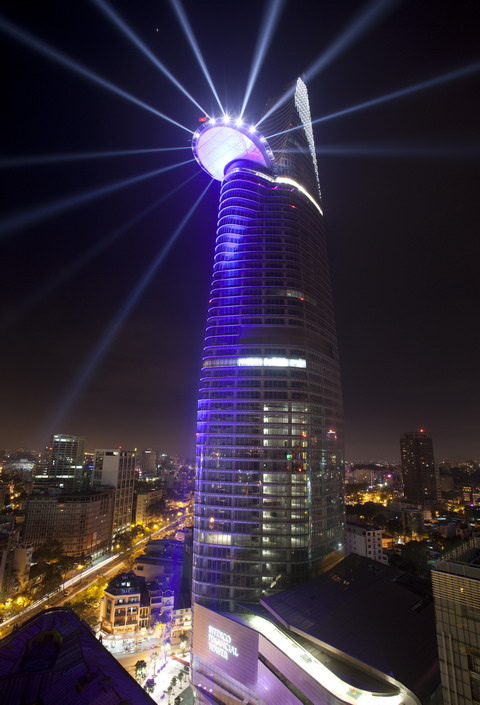 The BFT tower was designed by Carlos Zapata, a renowned architect who has designed the Cooper Square Hotel in New York and Sodier Field Stadium in Chicago (USA). 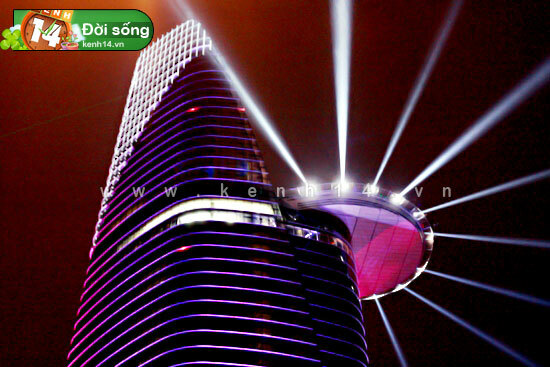 Structural steel and glass of the building simulated a lotus – the national flower of Vietnam. 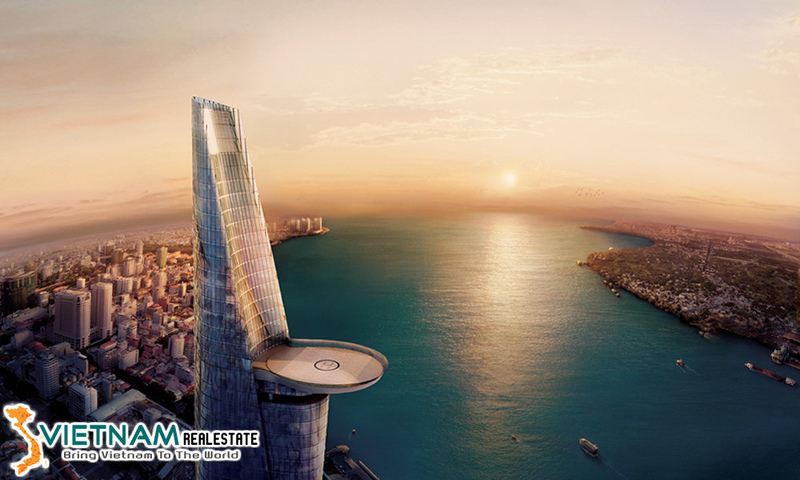 Advantages of the tower include a helicopter pad on the 50th floor and it’s ability to withstand earthquakes that measure up to eight on the Richter scale (Badass! Now to test that..muaha ;)). 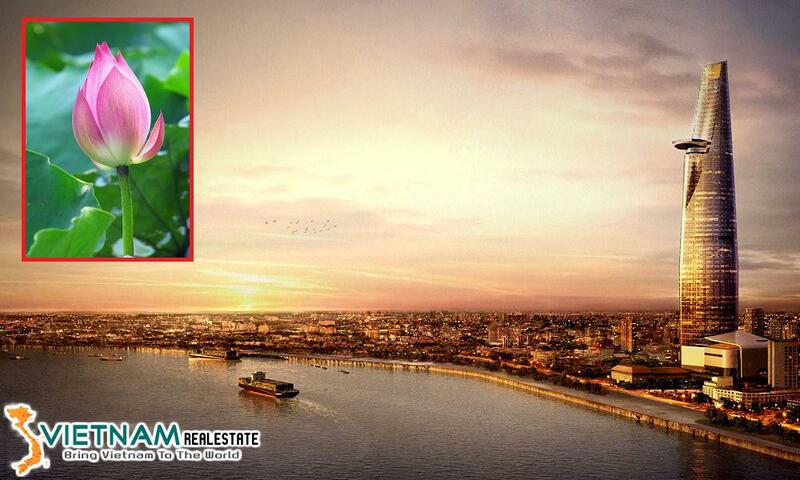 Located at the heart of Ho Chi Minh City’s business and entertainment belt, bordered by District 1’s Ngo Duc Ke, Hai Trieu and Ho Tung Mau streets, the project estimated a whopping cost of about 270 million USD. Sorry if this is a stupid question, but is this their “Times Square Project”? 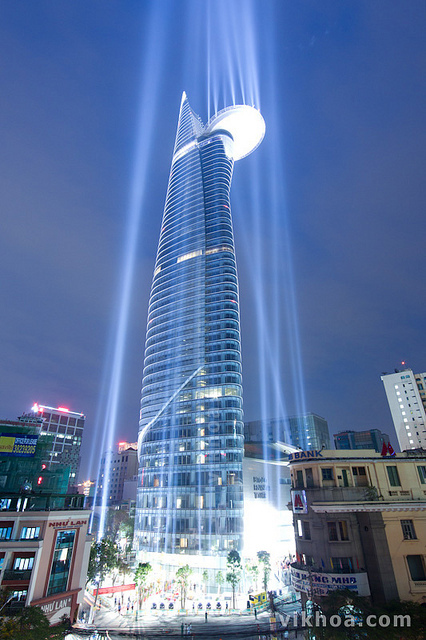 Cause I saw them constructing on that when I was in Saigon over the summer. Take me to Viet Nam!!! also, *cough* @Mai : No, that’ the Bitexco Financial Tower, they barely got started on the Saigon Time Square or whatever it’s called. @asdfghjkl; : You serious about more buildings being built??? Wow. I’m hoping to see this soon when I go to VN. I want to see the Star Bridge as well. 🙂 I hope our country will look as good as other countries soon. GO VN!!!! nice building…is that picture real is it’ computer generated. anyway it’s look nice. But does it always have that lighting…kina a waste of electricity..no wonder my aunt keep saying that have constant blackout. no. there’s lots of blackouts because the government is selling our energy to neighboring countries for profit. or that’s what i heard when i was in vn. 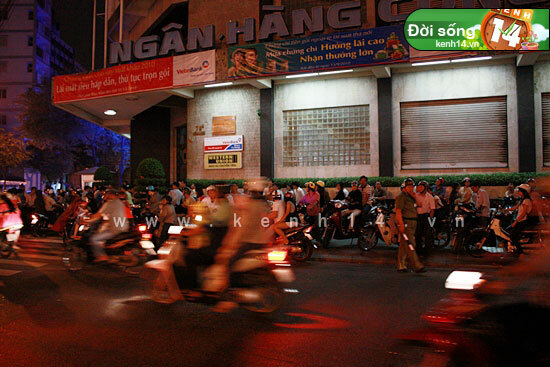 the power was out every other day in khanh hoa. and im sure the light show was just for the inauguration ceremony. ..
You can actually see that tower clearly from anywhere in the city, pretty cool. And for the power cutting thing, it’s because we depend too much on hygiene electricity, which is very unstable and easily affected by the weather. The power selling thing is just a stupid rumour. That’s nice. But worry about current problems in the country first, then spend a $200 million on a skyscraper. I’m happy that Vietnam is progressing and building all these beautiful buildings, but it’s only progressing for the rich people, while poor people are getting poorer. …and that is nothing to be proud of. The opening of the building means more jobs are being created.. but who is it being created for? Most likely, the rich will get the job more than the poor which goes back to hmm’s statement: “but it’s only progressing for the rich people, while poor people are getting poorer”. I don’t think the amount of janitors will be more than office workers/secretaries, etc.. whether it’s done by someone rich or not. And of course, they won’t get paid as much. There are negative effects of tourism. Tourism provides income, but where will the money go to? Correct me if I’m wrong, but doesn’t the government control the money? If they do, why would they want the poor to benefit from it? But hey, that’s just what I think. 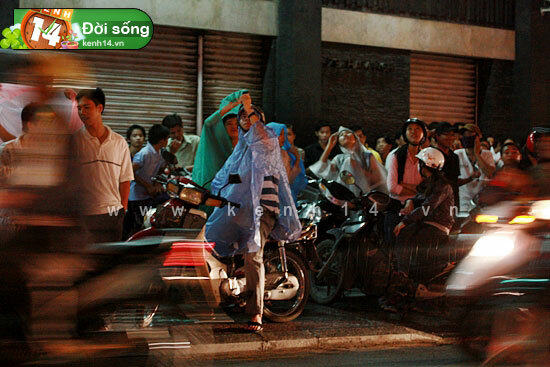 Not kidding when some posters say blackouts happen pretty often in Saigon. I went back there 2 years ago, the first day i got there during summer was black out at my grandfather’s place in district 6. Cool!!! 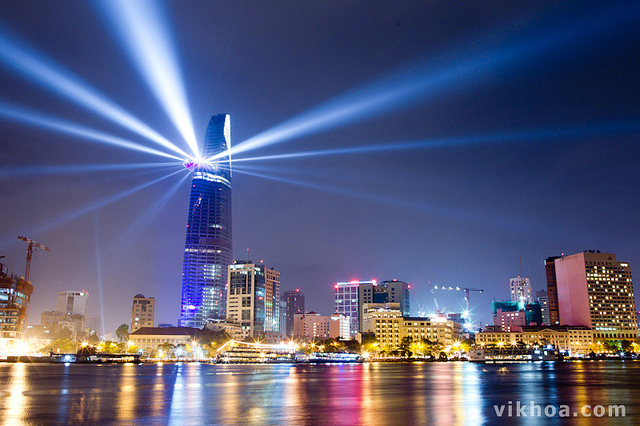 SAIGON is gaining back title! truly THE PEARL OF FAR EAST!